Last update issued on September 14, 2003 at 03:55 UTC. The geomagnetic field was quiet to unsettled on September 13. Solar wind speed ranged between 450 and 597 km/sec. Solar flux measured at 20h UTC on 2.8 GHz was 96.1. The planetary A index was 11 (STAR Ap - based on the mean of three hour interval ap indices: 12.1). Three hour interval K indices: 33332222 (planetary), 33333211 (Boulder). At midnight there were 2 spotted regions on the visible disk. Solar flare activity was low. A single C class event was recorded during the day. Region 10456 decayed substantially during the latter half of the day and lost penumbra both in the leading and trailing parts. A magnetic delta structure developed early in the day but was gone by midnight. Flare: C2.2 at 07:42 UTC. New region 10458 emerged in the southwest quadrant on September and was numbered by NOAA/SEC the next day. 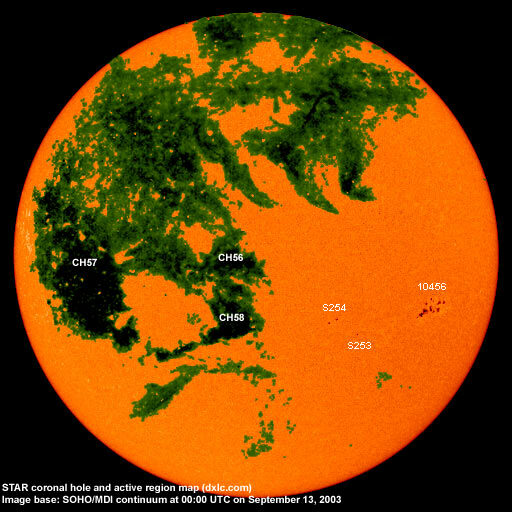 September 11 and 13: No potentially geoeffective CMEs observed. September 12: A full halo CME was observed early in the day. The CME was best defined over the south pole and was faint over the northern limbs. The source of this CME is likely the B8 event which occurred late on September 11 when a filament erupted just south of region S253. The CME is likely to reach Earth early on September 15. 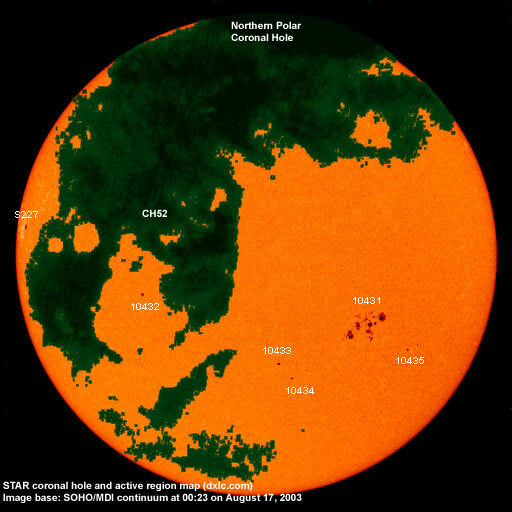 Small coronal holes (CH56 and CH58) near the equator were in a geoeffective position on September 13. A recurrent trans equatorial coronal hole (CH57) will rotate into a geoeffective position on September 15-17. This coronal hole has been developing during the last couple of days, particularly in the section located in the northern hemisphere. Processed SOHO/EIT 284 image from 01:06 UTC on September 14. The darkest areas on the solar disk are likely coronal holes. 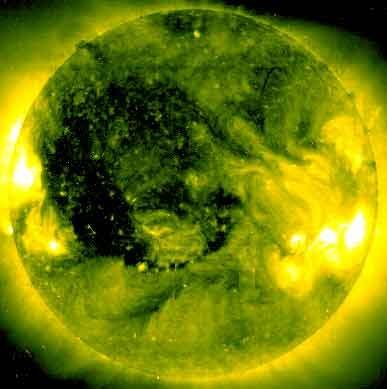 The geomagnetic field is expected to be quiet to unsettled on September 14. 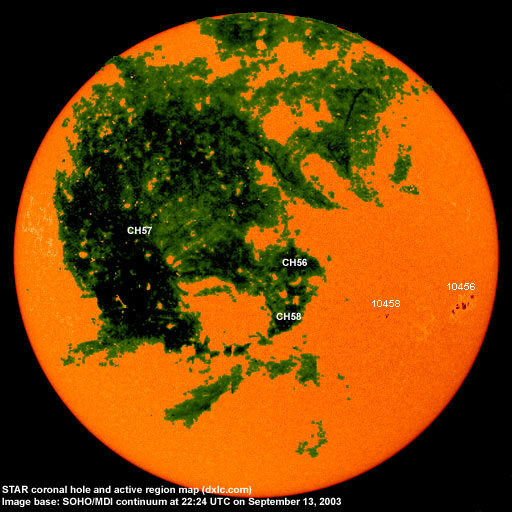 High speed streams from coronal holes CH58, CH56 and CH57 will likely cause unsettled to active conditions on September 16-17 and unsettled to minor storm on September 18-20. The CME associated with a filament eruption late on September 11 could cause unsettled to active geomagnetic conditions early on September 15. Long distance low frequency (below 2 MHz) propagation along east-west paths over high and upper middle latitudes is fair. Propagation along north-south paths is fair. [Trans Atlantic propagation conditions are currently monitored every night on 1470 kHz. Dominant station tonight: Radio Vibración (Venezuela), however, several other stations were noted including at least one US station].